It’s like that. I imagine that, were she an optimist by nature, this wouldn’t be as big an issue as it’s become. The fact is, however, that K can be a real complainypants. K: No fair! I only got one candy and those kids got three! Me: Let’s try that again. Isn’t it wonderful that we get to go to a shul where there are grownups who give out candy to the kids just because they want to? K: But they got more than me! Me: But look! You got candy! And it’s purple – that’s your favourite! And it’s so yummy! I’ve made this a priority with K right now. I know that what we do becomes who we are, and I don’t want her to go through life complaining about every minor injustice. Gratitude leads to happiness, and all that. What I really want to do is make gratitude and hakarat hatov habitual for her. I can’t change her personality, but I can help her change her default behaviour (can’t I?). 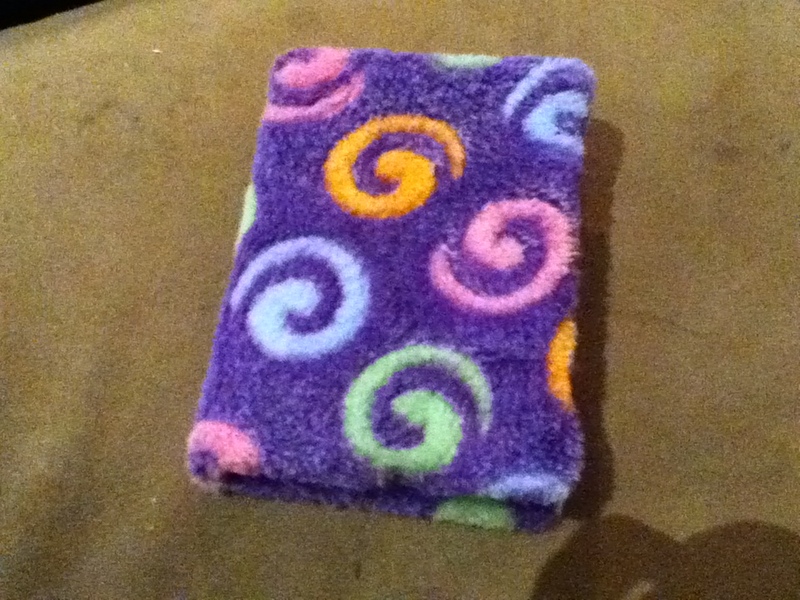 It’s a fuzzy journal. You know, for all the things that give her a warm, fuzzy feeling. It’s her hakarat hatov book, and we write in it every night. K chooses one good thing about the day, that she’s thankful for, and we also write down one Mitzvah or Chesed (kindness) she did during the day. So far it’s slow and painful going. Every night I ask what she’s grateful for that day, and every night she says, “I don’t know… I don’t remember!” I list all of her activities that day and she still doesn’t know, or she’ll say, “Yeah, that one.” as if she’s too lazy to repeat the words I’ve just said. I insist that she says the words herself (“I’m thankful for the tooth fairy.”) As for naming a mitzvah she’s done that day, right now I’m telling her what I noticed. Maybe in future she’ll identify those for herself. Right now I’d settle for her telling me – the first time I ask – what she was most thankful for. I hope that gratitude is like a muscle, and that K’s will grow stronger with this exercise. For the time being I’m grateful for the opportunity to help her build character.